There has been recently a spate of questions about freeze injury in strawberry transplants, so this is a topic which merits some discussion. 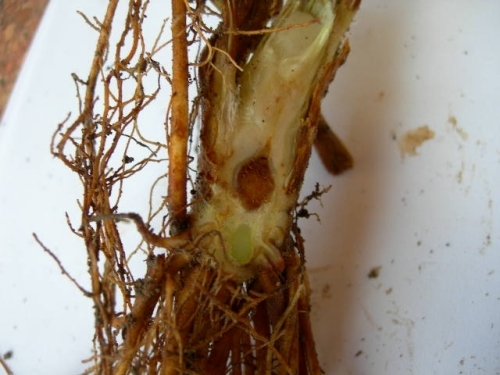 The freeze damage seen in transplants has been in the crown. The crown of strawberry (which is actually a shortened stem) is composed of several parts. The central part of the crown is called the pith and is made up of parenchyma cells. In plants, parenchyma cells serve to fill up the space between more specialized cells. Surrounding the pith are several more layers, in order from inside to out: the vascular layer containing the important food and water conducting elements, a cortical layer made up of yet more parenchyma cells and finally the epidermis on the very outside. The pith is most sensitive to frost damage. The damage is caused by the formation of ice crystals in the parenchyma cells and the affected area of the pith, which is normally white, turns brown. 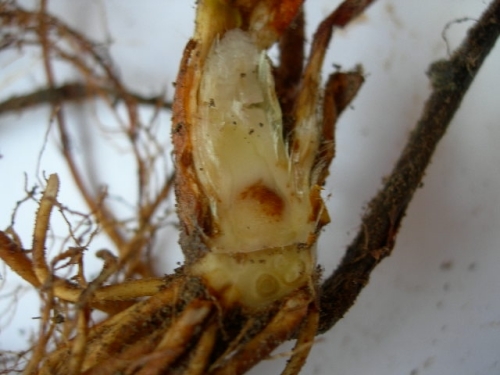 Generally, lesser freezing injury is represented by a browning of a portion of the pith and, according to the literature, growers should expect to see little if any effect on the later growth of the plant. However, with greater injury, the pith takes on a deeper shade of brown and the surrounding vascular layer turns brown or even black. 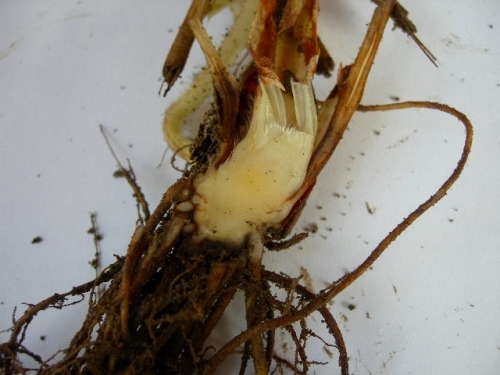 Any injury to the vascular layer will represent loss of later plant growth, since the food and water conducting elements located in this layer have been damaged or destroyed. As a reference to the above and more detailed information, readers are encouraged to read the section on crowns found about a quarter of the way down in the following document provided by the National Agriculture Library of the USDA. The series of photos included here are intended as a rough guide to identifying and passing judgment on the severity of freeze injury in strawberry tranplants. Each caption describes the picture above it. Healthy crown. Note that pith is white and free of blemishes. Freeze damaged crown. Discoloration is light and limited to pith. This plant should be OK. Severe freeze damage. Damage to pith is dark, and odds of damage to surrounding vascular tissue are high. This example would not be suitable for planting, because the probability of at least some yield loss is high. Crown wiith low chance of successful establishment. Note how dark freeze damage is, as well as the amount of damage outside of the pith. During the last two months, this office has had many samples of strawberry and raspberry fruit infested with fruit fly larvae submitted. What has been notable about this species of fruit fly is that it is infesting maturing fruit, rather than over-ripe and rotten fruit, as is the case with the vinegar fly that we are all accustomed with. These new fruit flies found this fall have been found in very high numbers in strawberry and caneberry fields northeast of Watsonville. The new species of fruit fly is Drosophila suzukii (misidentified in November 2008 as Drosophila biarmipes). Adults of this fruit fly found are almost identical to the regular vinegar fly, Drosophila melanogaster, with the exception that the males have one black spot on the back portion of each wing. I have submitted samples to the California Department of Pesticide Regulation and found that this fruit fly is not new to California. It is categorized as a Class ‘C’ pest and is not subject to any exceptional regulatory scrutiny. 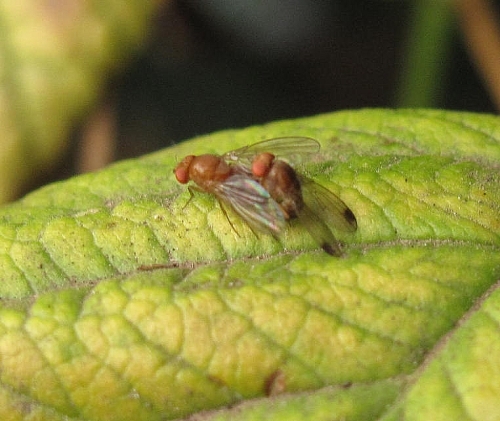 It is imperative that growers look for this fruit fly early on next year, and take steps to control it early, before it becomes a pest of the proportions it has been this year. It is advisable not to leave strawberries and caneberries to continue to fruit without harvest over the winter, as it is suspected that the D. suzukii will continue to breed and multiply in these areas. Having large numbers of this pest overwinter will only exacerbate problems next year. While the embedded larvae are not controlled short of destroying the fruit, the adults are relatively easy to control with pesticides. Malathion is effective for conventional growers, and Pyganic is very effective for organic growers. Since only the adults are being controlled with pesticide applications, multiple applications spaced 7 to 10 days apart will probably be best for long term control. There are several insecticides mentioned for control of fruit flies in this article. Before using any insecticides, check with your local Agricultural Commissioner's Office and consult product labels for current status of product registration, restrictions, and use information. 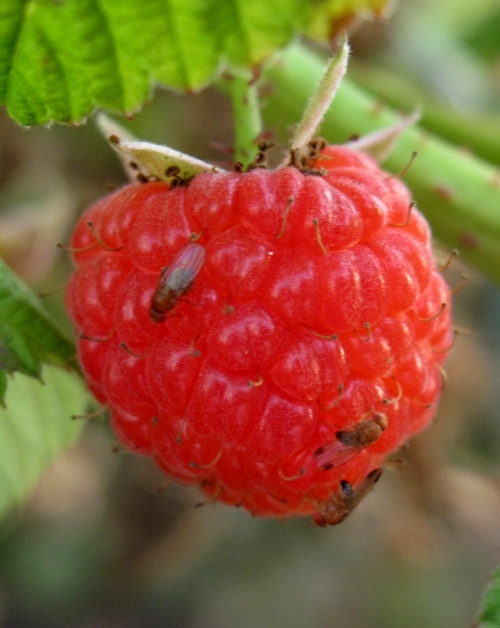 Drosophila biarmipes on raspberry fruit. Mating pair of Drosophila biarmipes. Drosophila biarmipes in trap. Note how easily visible the black spot is on individual male flies. 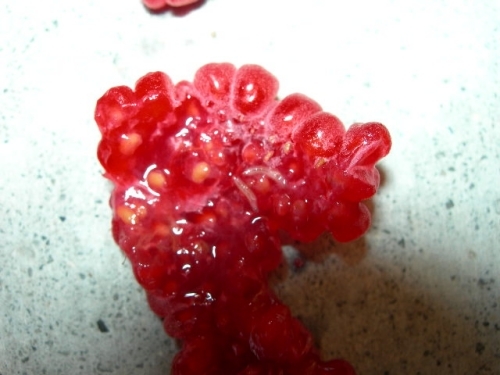 Two Drosophila biarmipes larvae embedded in a raspberry fruit. They are the long white objects in the center of the photograph. Raspberry sawfly, Monophadnoides geniculatus, is an uncommon pest in raspberries on the Central Coast of California. I recently had a question concerning this pest, so it something worth discussing. 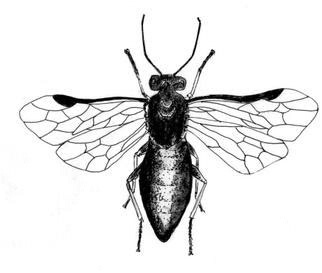 Raspberry sawflies are not flies, but actually wasps. The larvae, since they are fixed on the leaves and damage them, draw our attention as pests. Larvae are usually found on leaf undersides, are ½ of an inch long, light green in color, and have a brown stripe down the back. 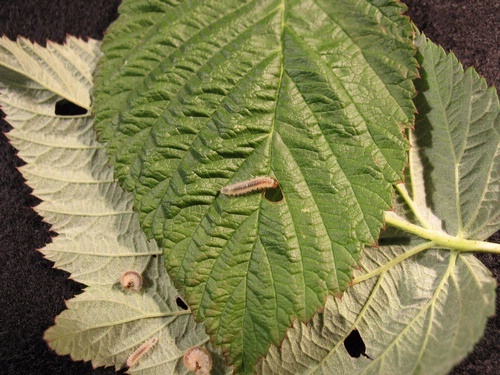 Larvae generally occur in groups, so a closely spaced group of punctures and holes in the leaves should be a signal to look for raspberry sawfly. Being very mobile, the adults are seen far less. The adult wasps are flattish and have a thick body roughly ¼ of an inch long. Female adults also have a yellow white band across the back of the abdomen. In almost all cases, sawflies do not merit control, since in a light to moderate infestation, sawfly larvae will make a few holes in the leaves and not compromise fruit yield. 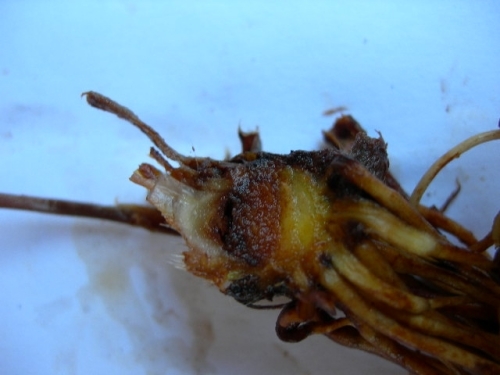 However, more severe infestations, of the sort that we have not yet seen on the Central Coast, have the potential of eating all the leaves and seriously damaging the plant. 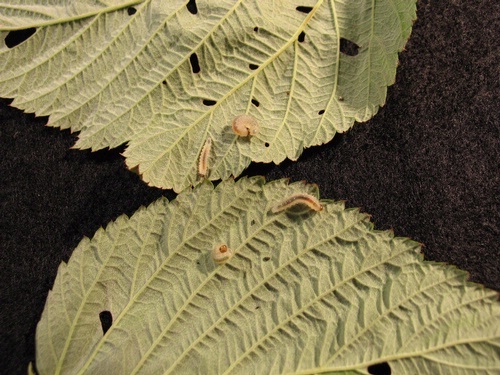 Probably the most important point of this writing is that growers do not confuse raspberry sawfly larvae with more damaging moth larvae, since chemicals used to control them can be different. Please be informed that this year's Annual Strawberry Production Meeting for the Central Coast will be held on February 5 at the Elk's Lodge in Watsonville, the same place as last year.